Who is it? I want to know. Who is hoarding all the 32″ US8 circular needles in the San Fernando Valley? 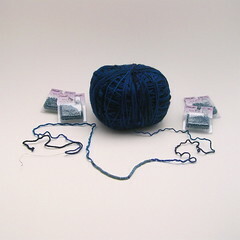 I am working on a project knit in the round with a whole mess of decreases. 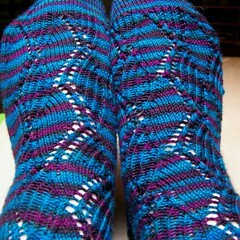 After I got gauge on my trusty size 8 Crystal Palace circs, I didn’t want to mess around with any other needles. So I went ahead and cast on with my 16″ circs. You know how the instructions always tell you to be careful not to twist? When you cram way too many stitches on a 16″ circ, it becomes clear why pattern writers think knitters need a reminder about that. After at least two false starts, I got a good way into the pattern before completely losing it somewhere and ripping out the whole darn thing. That was when I decided to get a longer circular. It was Sunday afternoon, and I had a load of laundry going. 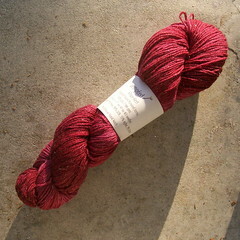 It had another 20 minutes to go, and my favorite LYS is open for exactly 3 hours on Sundays. I slipped on my sandals and headed out the door. They didn’t have the needles I needed. They don’t carry Crystal Palace circs at all, which is fair enough, although they do carry the Crystal Palace DPNs. I scoured the rack of Addi circs for quite a while before I realized that among the many, many plastic-swathed needles there were no 32″ circs in a size US8. US7? Sure. How about 9? You betcha. With a sigh, I got back in my car and drove to my local big box craft store. 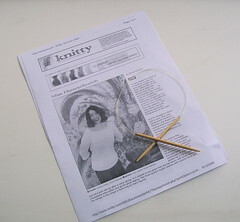 I made a beeline for the knitting section and located the array of Crystal Palace circs. Size 8 in 16″? Check. Size 9 in 29″? Check. Size 8 anywhere between 24″ and 36″? Not so much. In fact, that was the one completely empty hook on the wall. I cornered an employee and asked when they might be restocked. “The truck comes on Fridays,” he said. Home I went, where I once again cast on with my 16″ circ. With a dedication to counting stitches that borders on the Obsessive-Compulsive, I have successfully reached the end of the first set of decreases, and by this point I was supposed to have switched to a 16″ circ anyway. Just in case, I stopped at a big box craft store near work last night and picked up a 29″ circ. It can’t hurt to be prepared. 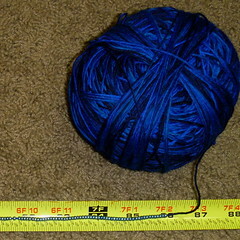 I’m starting to wonder if this particular yarn is cursed. Looks perfectly innocent, doesn’t it? 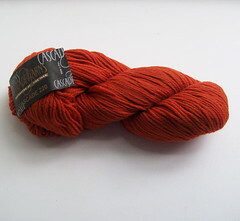 Nice orange Cascade 220 all skeined up, waiting to be knit into a cute toy for Little Miss. My plan was a carrot from Amigurumi Knits for my daughter’s play kitchen. I popped the yarn onto my swift, wound it up into a ball, cast on, and happily knit away for several rows before realizing that I had miscounted somewhere along the line. Off to the Frog Pond with the carrot. Maybe I should try something else. So, I cast on The Deadliest Crab and knit merrily away for several rounds, all the way through the first set of bobbles, and then I noticed that something was wrong. Miscount. Again. A really big one this time, and I could not for life of me figure out what happened where. Ripping out stitches can be so satisfying. I’m hoping the third time is a charm in this case. If this one goes all wonky, I’m afraid this skein will be in need of a time-out, and I’ll just have to comfort myself with stringing another couple hundred beads for Entomology. I’m all set to get started on Miss Honeychurch (which I keep calling Miss Honeydew – perhaps I need more fruit in my diet), except for one thing. 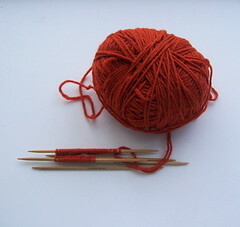 But I have my pattern and a short circular needle for swatching. My plan is to read the book and knit the sweater over the course of July and August. 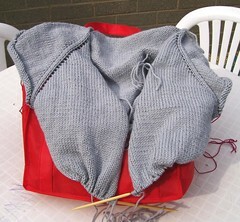 The sweater should will be done by Labor Day, which is still quite warm in this part of the country. 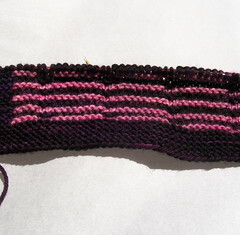 Each charted row is actually four rows of knitting (two in each color). It’s going a little quicker now that I’ve marked every 10 columns on the chart for easier counting. 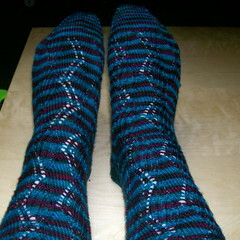 And it only took ripping out two rows to get me to do it! 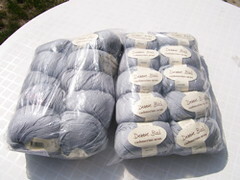 And my beloved blue skein of Wollmeise informed me that it didn’t really want to be socks (after I started a cabled sock not once but twice!). 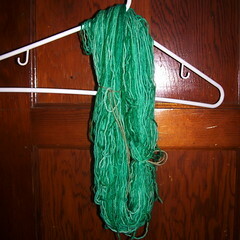 It wants to be the Entomology shawl. How could I argue? 250 beads down, 955 to go. Last night, as I was outlining a candy cane in Santa’s pocket, I discovered a mistake. 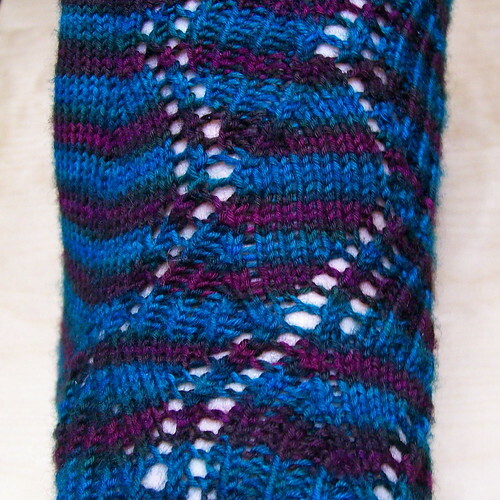 Three little red stitches, painstakingly placed… one stitch to the left of where they should have been. I adjusted the outline and moved on. 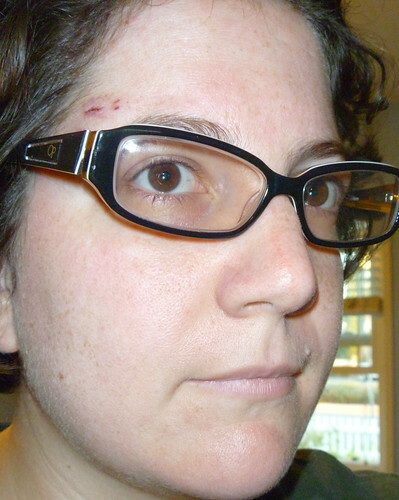 I am so not ripping out three stitches less than two weeks before Christmas Eve. I did, however, rip out two French knots that have been bugging me ever since I did them. They looked sloppy and wrong, and they will be redone. 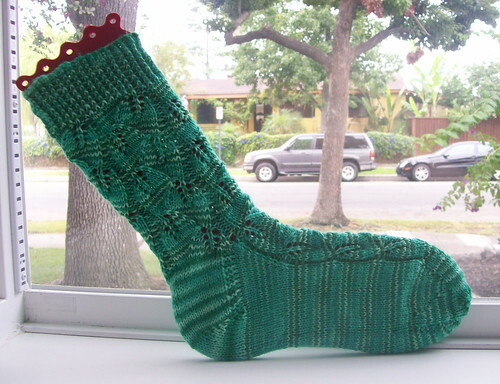 While my crafting energies are focused on the stocking, I’ve also been fiddling with my Queue over on Ravelry. 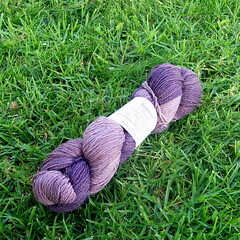 I’ve been matching up projects in my Queue to yarns in my Stash, and I discovered that I already have the yarn on hand for 30+ projects, including two sweaters for Little Miss that may not go up to an appropriate size now. Given this situation, it’s time for a Stashdown. 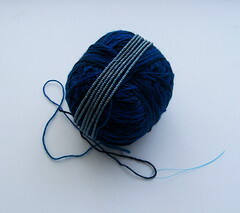 In the New Year, I’m going to focus on the projects I’ve lined up and the yarns I’ve got tucked away. I’ll let y’all know how it goes.